No matter how you choose to celebrate or not today, may you have family, friends, love, shelter and food. with some pastels, bunnies, candy, or crosses. Show us how you celebrate this Easter season. Tga it up on YouTube, IG, Facebook, Pinterest or your blog using #ECEASTER2018. Feel free to link up below as well. I wanted to create something to decorate my home with for Easter - but not in the usual pink-yellow-greenish colour palette one can find in the shops right now. I needed something to fit our dinette which mostly has warm brown-ish colours from the different sorts of wood our table, bench and chairs are made of. And as I wanted to have my Easter wall hanging look a bit festive, I used some of Seth Apter's beautiful Baked Texture embossing powders too. Yes it's Easter and we wanted to warm up your weekend with this fun and Spring welcoming holiday. Today we have our first new DT member of the year! Join us in welcoming Karla. Hi friends! 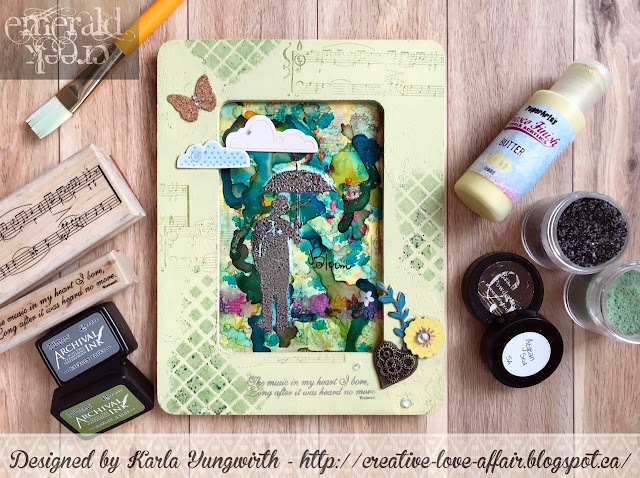 It's Karla here today to share my first Design Team post on the Emerald Creek blog!! I'm so excited to show you how I use some of the amazing products available at the Emerald Creek shop, and I'll be bringing you lots of video tutorials all year! Today, I have an Easter Canvas to share using beautiful stamps and powders from the Emerald Creek Store, combining them with diecuts and stenciling. I had so much fun creating the DIY Enamel Embellishments using stamps and Baked Texture Vintage Beeswax for this canvas! You could make lots of these and use them for all your papercrafting - canvases, cards, scrapbook pages! Thanks so much for stopping by today! I hope you have a wonderful and creative week! Embossing Powder has been around for decades, but now like this. We create embossing powders that achieve finished results without dry times, toxic fumes, or gooey messes. Baked Texture was designed for and with Seth Apter because he is a medium artist, not a typical paper crafter. When he teamed up with us, he brought ideas of texture and colour that is not know in the embossing powder world. Because of this wonderful pairing we have created a product that is taking the Craft and Art world by storm and we want to answer some of the questions we are seeing frequently. Today we are talking about packaging. You may have wondered why some jars appear less full then others. You may be thinking 'Hey my Rocky Road looks more black then I expected or have seen'. I hope this helps clear up a few questions but please feel free to ask any that you have. We have about 2-3 weeks left and we will be caught up. Thank you for your Patience, Love and Support. My favourite part of last month's challenge was watching people begin to tag up on different social media. You may not be a blogger but your talent deserves to be recognized so don't miss out in playing along. We LOVE seeing your art! Now to bring on the NEW Challenge. are on the horizon and we are desperately ready to kick off the winter ice shackles and warm up with some pastels, bunnies, candy, or crosses. Show us how you celebrate this Easter season. Tga it up on YouTube, IG, Facebook, Pinterest or your blog using #ECEASTER2018. Feel free to link up below as well. I have a quick card featuring the Rabbit, Stinger, Little Flower and Flower stamps, plus a splash Easter Parade & Clear Gloss embossing powder, A quick splash of Seth Apters paints in a soft wash for some spring colour and you're done. Layering up the cardstocks. a piece of stampin up and of course Tim Holtz Metallic. The Creative Scrapbooker Superstock is edged in the Easter Parade ep to coordinate with the flowers. I also used the Creative Scrapbooker SuperStock to layer up on. I love this cardstock for bases and die cuts. Lucky or Love Dare with her Love You Card entry. 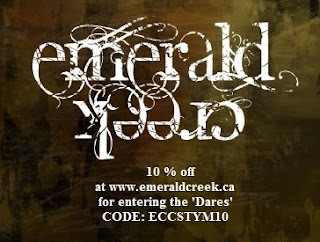 Drea please email info@emeraldcreek.co for your prize code. To play we need you to link up ANY social media project pics you are posting this month that fit the category. #ECEASTER2018 on your posts as well so we can reference them and if you add and tag various Emerald Creek product you will get a bonus entry. At the end of the month we will pick a winner and send a prize pack to the Winner as well as link up their project and share it out.